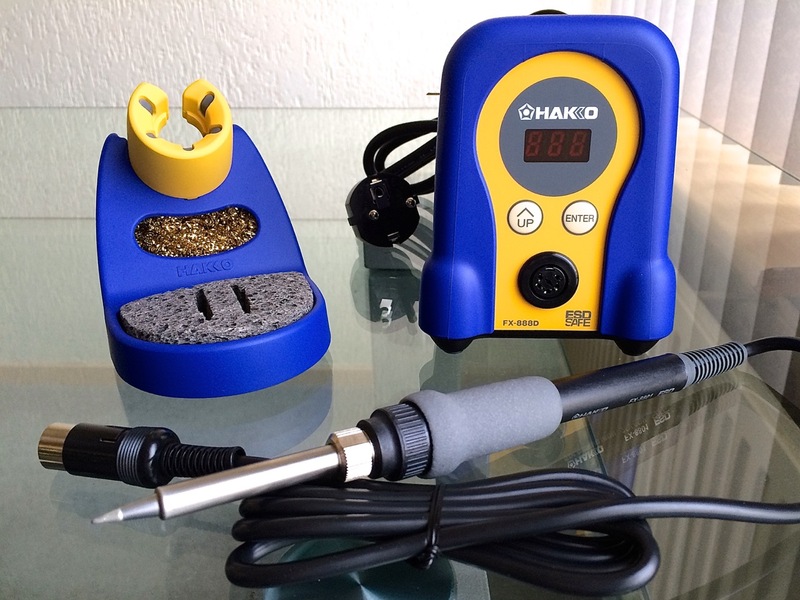 Let’s start with the tool I’m most excited about, the Hakko FX-888D. This superb quality Japanese soldering station has an accurate digital control for adjustments and presets, with a 65W iron that heats up to the required temperature (up to 480ºC) in mere seconds. The ESD safe soldering iron has a comfortable grip that doesn’t get hot, and a long, flexible cable to allow plenty of movement freedom. The station comes with a separate metal iron holder, complete with a cleaning sponge and wire. I chose an 888D in the traditional Hakko blue and yellow colors, but there is also a more neutral silver-colored version available. It was rather difficult to find a reseller in The Netherlands. While you can find Hakko soldering stations almost anywhere in the US, over here Weller and Ersa branded stations are a lot more common. After reading up on the 888D, and watching a bunch of video reviews, I still wanted one regardless, and finally found a supplier that had them in stock in Italy. The iron has a T18-B tip pre-installed. I’m sure there’s a use for these conical tips, but they’re not the best at transferring heat when soldering typical through-hole or surface-mount components. You’re much better off with one of the other tip variations available. Since I’m still figuring out what works best for me, I ordered several different kinds. 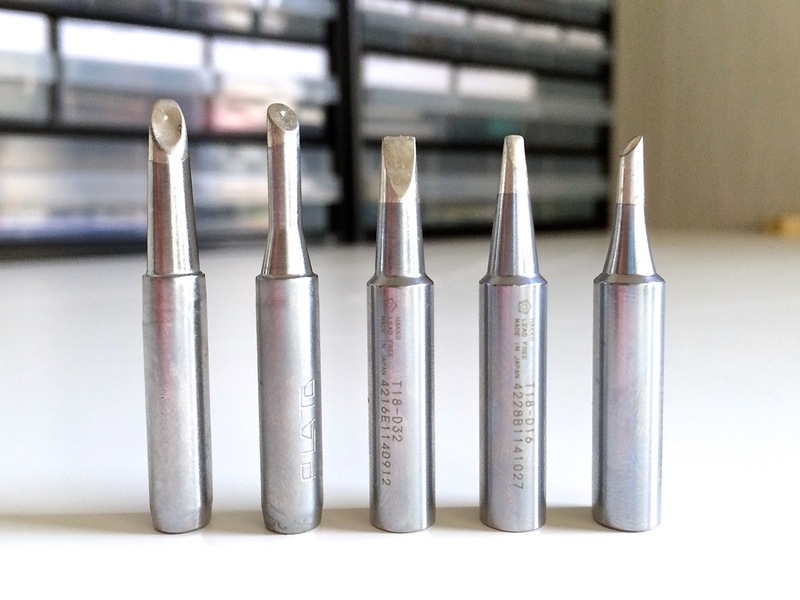 I bought two Hakko T18-D flat-blade screwdriver tips in 1.6mm and 3.2mm widths, one Hakko T18-C 2mm bevel / hoof tip, and two Plato HS-0530/0531 3.3/3.4mm SMD flow tips. I’m especially looking forward to trying out the Plato tips. Their shape is perfect for drag soldering while preventing bridges from forming. Apply generous amounts of flux to the board, fill the concave part of the tip with solder, and simply drag the iron across the leads and pads. Hakko has similar tips (BCM/CM) for their other soldering stations, but they don’t officially have any 888D-compatible ones. I’ve heard any 900M-compatible tip should fit as well though. 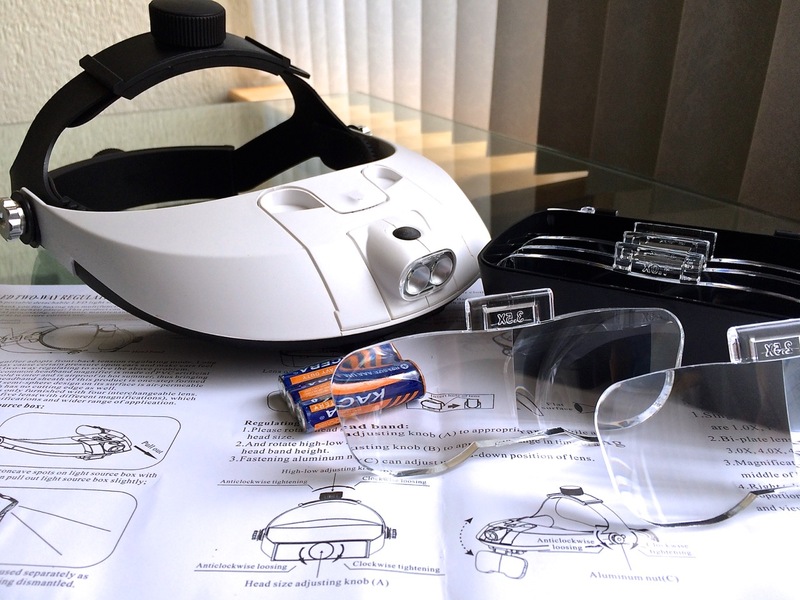 This cheap, head-mounted magnifier may not be as high-quality as the other products in this post, but it is a nice upgrade from the magnifying lens on my third hand. The magnifier is fully adjustable, with plastic straps that fit any head size, and additional knobs on the side to allow the unit to be flipped up, for a quick inspection of your work without the lenses getting in the way. A single lens can magnify up to 3.5X, or combine any two of the five supplied lenses for a max. 6X magnification. Using the two thickest lenses feels a bit straining on my eyes. so I only go up to 5X by slotting the 1.5 and 3.5 lenses. The battery-powered bright LED lights, mounted above the lens holders, can be adjusted to point straight down. They light up the target area quite well, but the batteries do add some additional weight. I prefer keeping the magnifier as light as possible, and usually remove the entire lamp module. Now that I’m moving on to experimenting with tiny surface-mount components, both the soldering iron and the magnifier will come in very handy. My wish list for a new multimeter included features like fast auto-ranging, backlight, temperature/capacitance/frequency, a large 6000 count display, and decent accuracy in the lower DC voltage/current range. Unfortunately this quickly drove the price up to $100+, which is twice as much as I wanted to spend. I ended up having to scrap a few requirements to get to a more reasonable $50-$60. 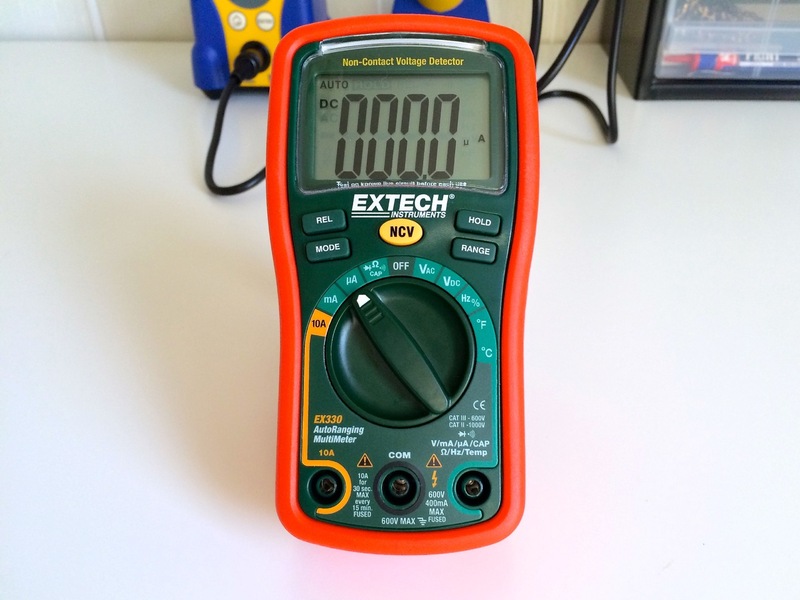 The multimeter that still fits most of my needs at this lower price point is the Extech EX330. I had to settle for a 4000 count display, and no backlight, but the EX330 does have all of the other features I’m looking for. It even comes with an included type K temperature probe, or at least should have. Mine is missing, and presumably fell out of the loose plastic packaging before leaving the supplier’s warehouse. I’m currently waiting for them to arrange a replacement part. 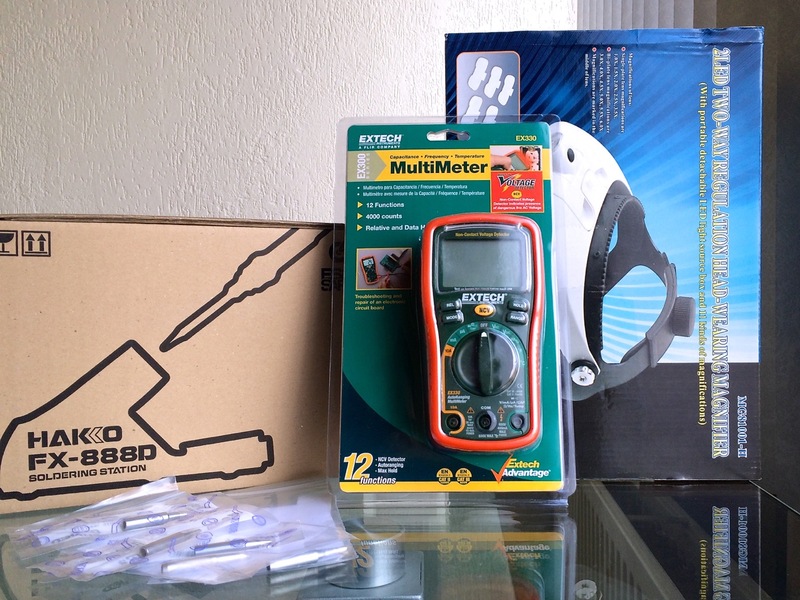 I’m not sure if the missing probe is simply a coincidence, or related to some of the reported quality issues with Extech’s EX series multimeters in general. The unit itself seems to work as expected. No loose connectors or strange measurements, although I still need to take a peek inside. 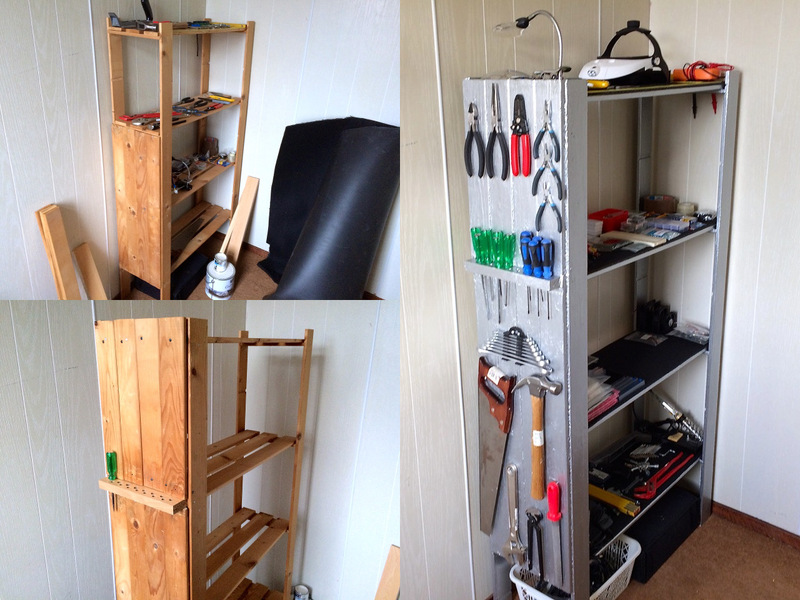 As part of turning my spare room into an electronics lab/workshop, I needed a place to store all my mechanical tools and accessories. I could have bought a nice wall-mounted tool panel, although that wouldn’t fit any of the larger stuff. Instead, in the spirit of the maker movement, I decided to build something myself. The plan was to turn an old wooden shelf rack into a tool storage, using leftover material I had lying around the house. I don’t have any experience working with wood, but this project sounded easy enough, and if it turned out horrible I could just buy that prebuilt panel after all. Luckily the result looked pretty much as I had imagined. I boarded up one of the sides of the rack, and turned it into a custom tool panel, including a small shelf with holes for screwdrivers. I then painted the rack, and lined the shelves with leftover fabric-covered rubber to prevent any smaller bits from falling through the cracks. At some point I may board up the back side as well for some additional tool storage, but I currently have more than enough space left. With these upgrades, I’m another step closer to acquiring all of the essential tools for my lab. My parts storage cabinets are getting rather full, so I may have to buy a few more, and move them off the bench. 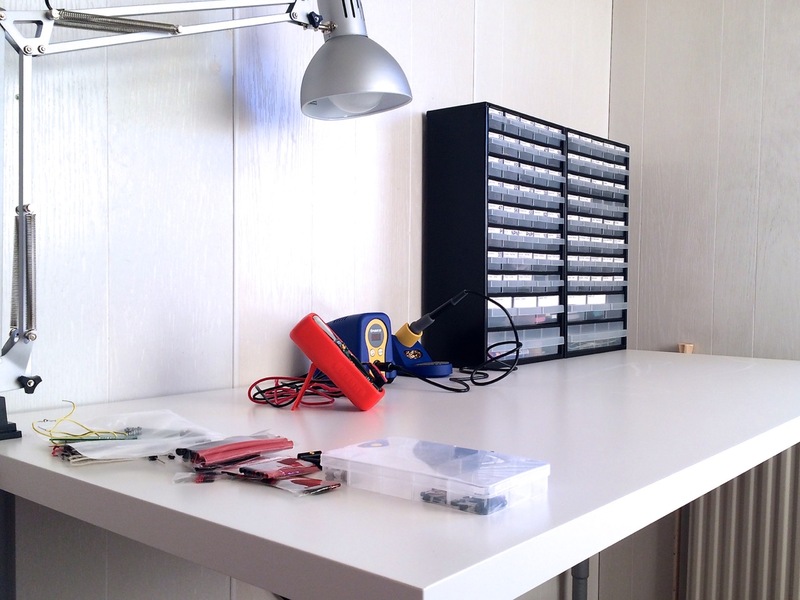 I also need a variable bench power supply or build my own, buy my first digital storage oscilloscope, and get a Dremel, glue gun and a cutting mat to work on project enclosures. I’ll get them all eventually, and learn how to use them along the way. I can’t wait to see what my bench will look like a year from now. FYI, I got my EX330 about 2 or 3 years ago from Radio Shack in the states – and it didn’t come with the temp sensor either! I contacted Extech and they sent me a small kit. I also just bought 4 or 6 additional K-type units of various sizes and tips – which I use far more than what Extech sent me. It’s nice to leave several temp sensors attached to various surfaces and simply unplug and plug in a different one to check a different temp. Hah. I wonder if they had a bad batch with missing thermocouples around that time. The product details do specifically mention one should be included. Mouser ended up sending me a replacement probe. I recently ordered a bunch of additional K type probes to play with as part of the reflow oven project I’m working on, and to replace the one supplied with the EX330, so I don’t have to worry about getting close to 250C. Btw, where did you get the concave tip from? Hakko doesn’t list it on their site. Ah, found them on mouser. Thanks!